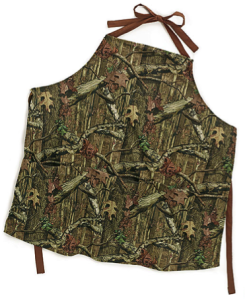 Mossy Oak camouflage adult apron with brown ties. 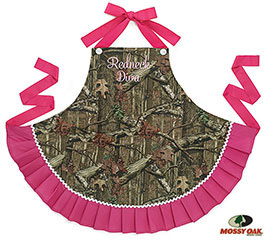 Available in child size for a handsome Daddy & Me team in the kitchen. Have some fun in the kitchen or crafting with your little one! 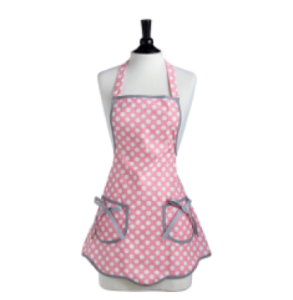 This cute vintage polka dot pattern features symmetrical waist pockets with removable grosgrain bows, grey bias trimmed edge, scalloped hem, and adjustable ties at the neck and waist and coordinates with the Rosy Pink Polka Dot Collection. Available in child size for a very cute Mommy & Me team in the kitchen. two waist pockets with removable grosgrain bows and adjustable ties at the waist and neck. Tie this one on to bake up a sweet cherry pie! Available in child size for a very cute Mommy & Me team in the kitchen. New for the kitchen helper of any age and size. 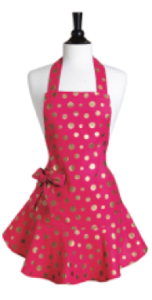 This apron features 3 bottom pockets for storing kitchen gadgets, chest pocket with snap, grommet tie at the neck, and adjustable tie at the waist. Available in two child sizes for a very cute Mommy & Me team in the kitchen.